The Federal Reserve’s Open Market Committee on Wednesday left its target rate unchanged at 2.25 percent to 2.5 percent. More than half the committee’s members signaled they don’t expect any additional rate increases this year. That’s a sharp change from December when the Fed was anticipating as many as three rate hikes in 2019. Policymakers highlighted the sluggish pace of hiring in February, when only 20,000 jobs were added, as well as a slowdown in household spending and business investment. Despite those warning signs, Powell stressed that the outlook for the U.S. economy is still positive. Consumer spending could bounce back, for example, after a disappointing holiday shopping season. “Given the overall favorable conditions in our economy, my colleagues and I will be patient in assessing what if any changes in the stance of policy may be needed,” Powell said. Greg McBride, chief financial analyst at Bankrate.com, said the U.S. economy is still performing better than others around the globe. 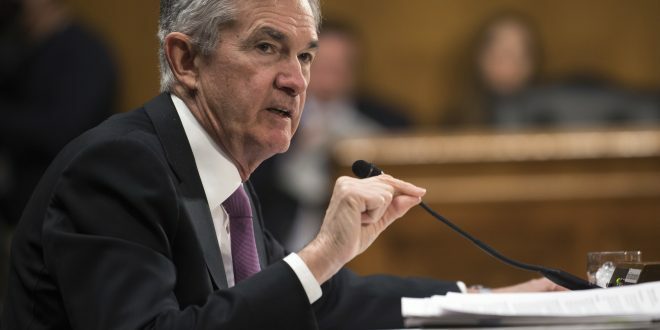 “The Fed is definitely on guard against a sharp economic slowdown, but in a global context, the U.S. economy is still the best house in a bad neighborhood,” he said. The Fed’s forecast for economic growth this year is well below what the Trump administration is projecting. Powell acknowledged that the economy could grow faster if more people are drawn into the labor force. But he added that slowing growth in China and especially Europe present “headwinds” for the United States. And ongoing trade disputes are not helping. Wall Street initially rallied on the Fed’s dovish stance, but later backpedaled. The Dow Jones Industrial Average and the S&P 500 ended the day down, while the Nasdaq was slightly higher. “By shifting from expecting three hikes this year as recently as last September to now expecting none, they are very exposed if wage gains continue to accelerate,” said Ian Shepherdson, chief economist at Pantheon Macroeconomics. Powell touted rising wages as a boon for the economy and said he is not immediately worried that bigger paychecks will trigger a spike in inflation. He also cautioned against reading too much into committee members’ forecasts of future rate hikes.